NASA's humanoid robot Robonaut 2 is ready for Super Bowl 2017, showing off numerous referee signals. 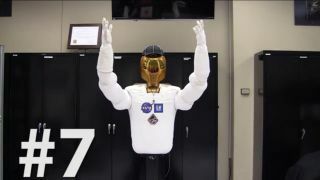 Sporting a referee's hat and whistle, NASA's humanoid Robonaut 2 (R2) showed off some Super Bowl referee signals in a new video. The robot, which is being tested on the International Space Station, used its hands and body to simulate the calls a football referee would make. The video offers viewers the chance to try to guess about 10 referee calls that the robot is simulating. Some of them include a touchdown (hands raised in the air) and a flag penalty (where the robot raises its right hand and drops a small, orange flag on the ground). R2 may eventually be upgraded to allow it to work outside the space station. This would allow the robot to take on tasks during spacewalks, which are considered some of the most dangerous activities for astronauts.